Do you sell the film only, without installation? How far will you travel from your location for quotes and installation? How will I benefit from 3M™ Window Film? Is the film difficult to maintain after installation? Will the film give a mirrored exterior appearance? Do you install window film on the inside or outside of a building? Can you apply window film to tinted or Low-E glass? How is 3M™ Window Film warrantied? Does 3M™ have a GSA contract? No. In order to be eligible for the 3M Warranty provided for the product and labor, ATD Solar & Security Inc. must perform the installation of the film. ATD Solar & Security Inc. will travel roughly a 300 mile radius from its home location in Frederick, MD, although all jobs are on a case-by-case basis and those with a far travel distance may be subject to a minimum installation price. No; depending on the film you choose, 3M™ Window Films will actually reduce so much glare, both indoors, and out, that they will add clarity to your view. 3M Window Films can lower energy bills, reduce heat and glare, eliminate 99% UV rays, decrease “hot spots” to increase efficiency of the cooling system in the summer and the building’s heating in the winter time. High quality 3M™ Window Film and scratch-resistant coatings make cleaning as easy as before. After thirty days, you may clean 3M™ Sun Control Films using normal household cleaning solutions, e.g. Windex, and a soft, lint-free cloth or towel – although one should stay away from ammonia-based products. You may also use a squeegee to clean the film. Abrasive products, which could scratch or damage the film, should not be used. It depends. 3M™ has developed a new line, the Night Vision series, that is actually less reflective than naturally clear glass. If you are seeking a privacy or one-way film, however, there are products that can help to provide an outside view during the day without the ability to see inside. No. The film’s specially designed adhesive will not adhere to Plexiglas®. The life expectancy of window film is dependent upon multiple variables (climate, exposure to sun, etc…). The average life expectancy is ten years and beyond; and, many customers have had 3M™ Window Film on their windows for over twenty years. 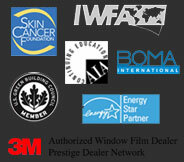 How is 3M window film warrantied? Please visit the warranty section within the Documentation page for more information. Absolutely! The amount of money saved depends upon the type of film chosen and certain property-specific variables (location, climate, existing energy costs, HVAC system, etc…). After obtaining some basic energy unit costs for a given building, we can conduct a 3M™ Energy Audit to estimate the annual dollars saved by different film types. Feel free to contact us for a free consultation and analysis. Absolutely! Furniture / fabric fade is caused by multiple factors. 10% of fading is caused by miscellaneous factors (i.e. fabric color, material, etc). 25% is caused by heat. 25% is caused by visible light. And the remaining 40% is caused by UV rays. 3M™ window films can mitigate 90% of the factors that cause furniture and fabric fade. No, the ultraviolet (UV) protection that we use in our proprietary adhesive system is indefinite. It does not lose its effectiveness over time. In fact, an actual glass sample from The Dumbarton House in Washington, DC was tested. This was a ten-year old application and the ultraviolet transmission still measured <1%! Yes! 3M™ has a GSA contract for both labor and material to facilitate government procurement.